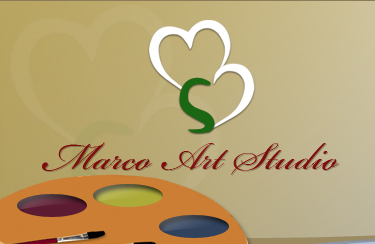 Multicultural, multi-ethnical, a melting pot of styles, trends, experiences of real life: this is how we can define the artistic work of master Marco Salvatore Mallamaci, because he is an all-round artist, able to use different languages and expressive styles to express his inexhaustible creativity. Based on these prerequisites he provides an own expressive code, declined in peculiar formal choices that make his work clearly recognizable. His passion for art that starts at a very young age, together with his indomitable nature that caused him to escape from the constrains of academic studies and to travel around the world, make him experience real life as a school and as a source of inspiration. His work is immerged in a metaphysical world, in a space without reference to time, but full of meaning and references to emblematic characters and historical events: each subject is tightly anchored to the imaginary of our contemporaneity in all its aspects. His collages, starting from the titling, excite curiosity, delight and make the observer think while he is transported in a rich and pointless world where nothing is certain, where there are no dogmas to respect but messages to communicate, resulting from experiences and reflections that unite us since no one is an island. Irony, sagacity, and great communication skills are therefore the ingredients behind this art that from the figurative also arrives at the informal to express the innermost feelings and emotions of the author's soul. It is a joyful, lively painting that willingly lets itself be seduced by surreal and metaphysical reminescences, but also by pop culture: his works are complex and articulate, always full of details that the eye must scrutinize with minuteness if it wants to grasp the depth of the overall vision. The word sometimes becomes part of the composition, a trace that accompanies the unveiling of meanings, almost a puzzle that combines logos and colors and that the observer must solve. Mallamaci uses oil on canvas and the technique of collage for his work, thus succeeding in rendering perfectly the stratification of meanings, which always accompany the dimension of memory. Memory plays a central role in the work of the painter understood both in a historical sense and in a personal sense: the executive expertise is combined with a deliberately suspended display, which evades contingency to suggest a critical reading of our present and a sincere existential reflection.